Now that I have one of my Windows XP workstations running full time on a Microsoft Virtual PC I decided that it was time to reduce the amount of RAM that it consumes. Nearly everyone knows there services in Windows that you can turn off to save memory and generally improve performance. What most people don’t know (including me) was exactly what services you can and can’t disable. That is now all solved with the Black Viper site. You can choose any current version of Windows and see which services can be disabled. You’ll find a table that gives you options for each version and allows you to customize your settings based on what type of system you want to run ( i.e. minimal, power user, etc). After using the information on the Black Viper site, I was able to reduce my Windows XP RAM usage from 415MB down to 305MB. Sure 100MB of RAM may not sound like much but that is greater than a 25% reduction! Best part was that after a reboot the system didn’t complain and everything I needed ran. So if you are looking to pare down the amount of RAM Windows is using take a look at the Black Viper site. Can you tell me something that you never get back? Something that is gone whether you use it effectively or not? If you said time then you’re right. It amazes me these days that people constantly claim they don’t have enough time yet they fill their existence with useless and wasteful activities. In a era when technology is supposed to set us free what people don’t seem to realise is that they are becoming more and more a slave to it. Most modern technology is designed to be interrupt driven. It is designed to make you stop whatever you are doing and pay attention to it. Don’t believe me? What do you do when your mobile phone rings? Answer it. What do you do when an email comes into your inbox? You stop what you are doing to read it. You allow yourself to be on instant messenger not to keep in touch but to allow other people with nothing better to do to interrupt you. Look at things like Facebook and Twitter (which I have been evaluating recently). Are these productivity tools? In some cases maybe but I can tell you I’m sick of getting poked, asked to play Texas Hold’em poker and fight it out in Dope Wars. Don’t you people have anything better to do? See what I mean? We are allowing technology to dominate our lives. We are allowing it to dictate what we are doing. How the hell can you hope to produce anything of quality when you are constantly being interrupted? Don’t forget it is not just the interruption that you have to deal with it is the requirement to get back to what you are doing that also takes time. The crazy thing is that technology actually allows us to be in control but we don’t seem to use it. Mobile phones have voice mail, emails get saved until we need them and so does stuff on Facebook and Twitter. We however seem in such an almighty rush to respond to thing immediately. One of the best books I have read recently is The Four Hour Work Week by Tim Ferris. He argues we should be working less and enjoying life more. He argues that most people are simply seeking to interrupt your day because they are bored and need something to do and worst of all they expect an instantaneous response. If you read the book and then step back and think about what he is saying you’ll find it makes a lot of sense. We all have a ‘dance card’ (hours in the day) that only is so big and we can only fit so much on it. You need to decide the highest value items that are going on the card and accordingly the lowest value items that don’t belong on the list. The only way you are going to fit more onto your ‘dance card’ is to be more efficient with your time and guess what? Some stuff just ain’t going to fit on! My advice is to start valuing your time more, because if it has no value then you’ll give it away for free and people will just keep coming back for your handouts. Focus on what you want to achieve and plan to achieve it. Ask yourself if you are making the best use of your time because, guess what? Even if you aren’t you are never going to get it back again! I think that I have mentioned this topic here before but some recent personal experience has brought the issue to the forefront of my thinking again. All the management, how-to and motivation books that you read these days seem to over look on very important aspect – your health. If you aren’t healthy then you can’t function, you can’t earn a living and you are generally a burden to someone else. Most people skate happily through life not really taking care of themselves until it is too late. Consider if you bought a car ran into the ground. It isn’t going to last nearly as long as one that gets serviced regularly. I doubt there are many people out there who would do that to a car they own these days but many let their health slide in a similar fashion. Sure, regular service costs time and money but over the long run the productivity benefits are HUGE. I think that the same applies to your health. If you are an integral part of a small business then imagine how that business would operate if you weren’t there? Maybe it wouldn’t be able to generate income, then what would happen? This is not to mention any personal costs that may also arise. The older you get the more chances there are of things going wrong, especially if you don’t take the time to maintain your health. Ever noticed the difference between when you feel run down and when you feel rested? The better your health the more able you are to cope with life’s stresses and strains. Put simply, your constitution is far more resilient with a little care. Problem is I think that nobody is really responsible for your own health expect you. It is something that is all too easy to neglect. The longer you let your health fall away the harder it is to get it back. It is not impossible mind you but it becomes harder with each day that you choose to neglect it. My question to you is, have a regular personal health plan in place? Sure, you may have a business plan but do you have a health plan, because in many cases without your health you have no business. You don’t have to train like an Olympian to win a gold medal but you do need to do something on a regular basis to maintain the best health you can. The easiest way is simply to incorporate as a regular part of a day. Sure, doing research on the net for a solution to problem is great but if you are laid up in and can’t do that how does that help you. It is important to see you health as a business asset and continue to work to improve it. If you don’t then probably nothing else is really going to matter is it? Just completed the upload of a video introducing Outlook Web Access. As usual you can view it on our hosted YouTube site at http://www.youtube.com/saturnalliance. I’ve tried a few more fancy additions using Camtasia which hopefully makes the video more professional. I must admit that when I view it the resolution seems poor (is that just me?). It may have something to do with the bulk video uploader I use. Basically, you upload a video once to the site and then you can upload from there to multiple video hosting sites, including YouTube. It must undergo some sort of conversion process when it gets uploaded from the bulk site to YouTube. Nobody seems to have complained as yet so I will assume that it is just me. Even if they did I think I would still use the bulk uploading site since it allow me to not only upload to a whole swag of sites but also track statistics, which is really handy to know what is being viewed. If someone really wants a better quality file then I’m happy to make that available (be warned, it is >50MB!). So simply contact me (robert@saturnalliance.com.au) to arrange. Take a look and let me know what you think, just remember that I am still limited to creating videos of not more than 10 minutes. This is a YouTube imposed limit and the only way that I can get that upgraded is to have lots and lots (I mean thousands) of subscribers it appears. So tell everyone you know to subscribe so I can get the account upgraded and add more content. Everyone knows the cliche “A picture is worth a thousand word” right? So maybe moving pictures are worth a hundred times this? In so many cases today I find that it is much easier if someone shows me what they are talking about rather than either me reading about it or trying to work it out myself. This was my idea behind my YouTube on line videos. Clearly I am not the only person who has been thinking along these lines. One of the best examples are videos created by The Common Craft Show which can also be found on YouTube. They videos are an excellent example of how to get a concept across in a very short space of time. I love the way they use drawings and cut outs to convey the ideas, it really must take them a while to do this but the end result is great! So if you are looking to understand things like Blogs, Wikis, Twitter, Social networking and the like have a look at the Common Craft Show videos. Well this week my YouTube videos have exceeded 80,000 total views. Quite a milestone I think. In all honesty, when I started doing them almost 2 years ago I did it mainly for client reference. It is much easier to point a customer to a video on how to reboot an SBS 2003 server than it is to send them a document or try and explain it over the phone. Since video files are typically large and it is better if they are also streamed I decided that hosting them on YouTube was the optimal option since there was no infrastructure cost and they would always be available and delivered quickly to all customers. Before long I was starting to receive emails and comments on YouTube that other people were not only watching the videos but that they also found them useful! Wow, the Internet is an amazing place I thought. Inspired by this feedback I created more videos that I though would be of benefit. As the number of videos I uploaded started to grow I began to keep track of their weekly performance via the KPI webpart on my public Sharepoint site (http://supportweb.ciaops.net.au). Each week I track figures like total views, average views, subscribers and so on. Each week I am pleased to say that all these KPI’s have been increasing. Although I doubt they will continue on this path in the long run, it does provide some confirmation that people are benefiting in some way from what is produced. So now it is on towards the 100,000 views mark. Unfortunately, YouTube currently has a limitation of only 10 minutes and thus it is becoming harder and harder to squeeze content into this time frame. I did apply to YouTube to have this limit increased but they said that what I present doesn’t meet their criteria to warrant an upgrade. My guess is that I need thousand’s of subscribers not hundreds. I know there are other mediums that allow videos of greater length but at the moment YouTube is the premier portal for video broadcasting technology so I’ll stay there. Hopefully, one day I’ll be able to uploads of greater length allowing me to add deeper content and detail on what I present but for the moment I do what I can in the time frame provided. So to all those who have subscribed and all those that continue to watch what I have produced – thank you. Having recently been working on a section for my Windows Sharepoint Services Operations Guide (sorry, but the more plugs the higher the rating in Google) about Windows Sharepoint Services accepting inbound emails from outside the organization, I was wondering what would be a good application of this feature. BING. I know, how about all those SBS monitoring reports we get sent from customer servers? Not only will they be stored in one location but with Sharepoint they also get index so we can search them. The more I started to think about this idea the better it became. Normally with SBS server reports (and other monitoring reports we receive) they merely end up in our inbox for review. However, if they appeared in a Sharepoint document library then we could add additional metadata. What do I mean by this? Well, I could add a field that allows me to select whether the report has been reviewed or whether it has errors that require further investigation. It also means that we can sort and categorize the information much quicker. Not only that, thinking about this a little more, it would also be possible to kick off a Sharepoint workflow as each item arrived. This maybe sending an alert to somebody to review the reports, then moving them to an archive location elsewhere in Sharepoint and so on. With Sharepoint the possibilities are really endless. I think that this is a really good example of how an IT business like ours can use Sharepoint to improve productivity and efficiency. All you need is a little imagination and Sharepoint of course. The only thing that you need to keep in mind is that if you have installed Windows Sharepoint Services v3 on your SBS server then you WILL NOT have the facility to receive inbound emails to Sharepoint. It is another great reason why a standalone Sharepoint server in a SBS network is a much better idea that one on the SBS server (not always possible I admit but don’t forget Virtual PC as an option). But then if you had my Windows Sharepoint Services Operations Guide you’d know that wouldn’t you? I have been doing a lot of document creation lately for my Windows Sharepoint Services Operations Guide. This has involved lots of screen shots, which I have simply done via the Print Scrn button and then pasting into a Word document. Problem with that strategy is that it creates REALLY BIG documents since the graphics are so large. 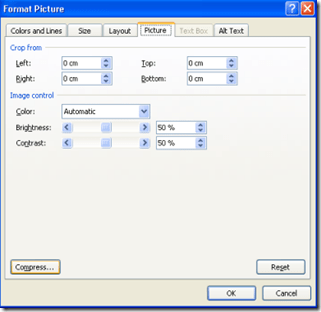 One solution is to paste the images into a picture editing tool first, compress them and then copy then into Word again. You can then set the options for what style of output you desire (i.e. web/screen or print for example). 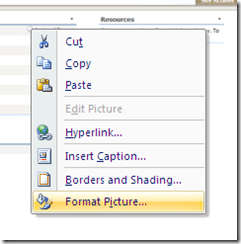 However up the top you’ll see the option to Apply this to All pictures in the document. Amazing! 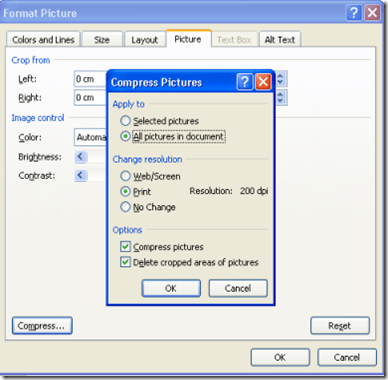 The Office document compression tool does a pretty good job as well and works well on those pictures you have simply copy and pasted from your digital camera. In one case a Powerpoint document I was working with went from 10MB to 1.5MB simply using the above compress feature. This feature is in both Office 2003 and 2007 but may have been there for longer. I am annoyed that it has taken this long for me to find this REALLY handy function, but at least I now know! As I said, every day I learn something new.